September 25, 2015 By heather Leave a Comment This post may contain affiliate links. Read my disclosure policy. One vacation I would love to cross off of my bucket list is Oktoberfest in Germany. My sister and brother-in-law were able to go several years ago and had so much fun. For now, I will be sitting at my dining room table with a full beer stein and my schnitzel sandwich dreaming of being in German beer garden. Schnitzel is a boneless meat, thinned and coated with flour, eggs, and bread crumbs. So basically fried chicken and who doesn’t love fried chicken? Putting it on a pretzel roll just ups the game and makes it the perfect food to go with “das beer”. My local grocery store sells the pretzel rolls in the bakery section and I believe you can also find them in the bread aisle. I served mine with some brown mustard, red onion, and lettuce. Cheers or “Prost”! Put flour, salt, and pepper in shallow dish. Whisk eggs and milk in another dish. Mix breadcrumbs and seeds in another dish. Season with salt and pepper. Dip in egg mixture and then breadcrumbs. Press to coat on each side. Place chicken on baking sheet and refrigerate, uncovered for 1 hour. Heat extra virgin olive oil and butter in large skillet over medium-high heat. Fry the chicken until golden brown, about 3-4 minutes per side. Remove and place on paper towel lined plate. Sprinkle with parsley and season with salt. 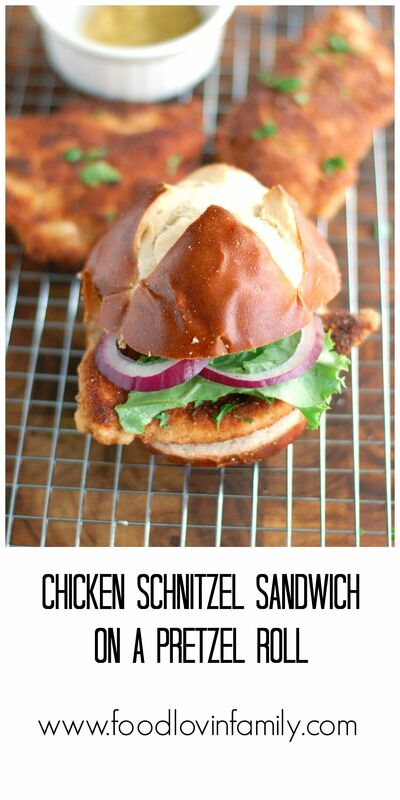 Place the chicken on pretzel roll and top with mustard, red onion, and lettuce.